It may or may not happen to everyone reading this blog, or maybe it has! 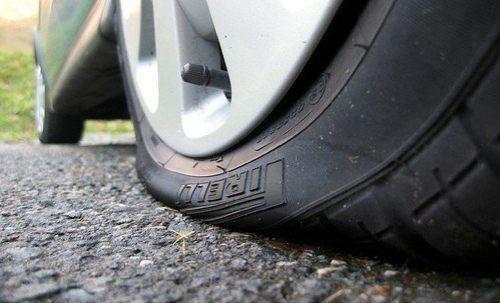 But for those caught in the unlucky situation of having a flat tire, you need to know what to do. Every vehicle comes with a spare tire and a jack to help you change tires, should you encounter a flat. Now we're here to provide you the know-how to do it! If you're on the freeway, taking the nearest exit is the safest bet, even if you have to drive a little ways with a blown tire. Otherwise, pull over as far onto the shoulder as possible. Don't park in the middle of a curve where approaching cars can't see you. Also, try to find a flat spot so you don't have to jack your car up on a hill. If you have a manual transmission, leave your vehicle in gear but apply the parking brake. This is the reason why your car was built with hazard lights in the first place. Now look around, sometimes under a seat or in the truck under a trunk floor panel, for your jack, wrench and spare. You may need to remove the hubcap (which can be easily popped off) Don't remove your lug nuts completely yet, but loosen them by turning the wrench counter-clockwise. If they're really tight, try placing the wrench on the nut and pushing on it with your foot to utilize your full weight. Or smack it with a rock if there is one nearby. Different models have different places to put the jack so it's always wise to consult your owner's manual for specific locations. Once the jack is securely in the correct spot, jack the car up until your tire is about 6 inches off the ground. Make sure to place the nuts in a pile or your pocket where they won't get separated, then pull the tire straight towards yourself and off the wheel base. Line up the lug nut posts with the holes in the spare, and push the spare all the way onto the wheel base until it can't go any farther. Don't put them on tightly all the way just yet. Make sure that they're on just enough to keep the spare tire on the car. Use the jack to gently bring the car back down to ground level and then remove it out from underneath the vehicle. With the car back on the ground, you can now tighten the lug nuts all the way. Rather than tightening them one by one in order, start with one lug nut, tighten it about 50%, move to the opposite nut across the circle, and tighten that one about the same amount. Keep tightening opposite lug nuts gradually in-turn until each one is as tight as possible. Don't just leave your trash laying on the side of the road, because that create a hazard for other motorists. Put it back in the trunk and take your car to the dealership for them to properly dispose of it. We have factory-certified technicians who are ready, willing and able to help replace your missing tire you so can keep your spare in good condition, should this happen to you ever again!